If you do not agree to these Terms, you may not access or use the Sites. In addition, if you are registering to use content or services accessible via the Sites, you agree that such usage is subject to any rules or guidelines applicable to such content or services, and such rules or guidelines will be incorporated by reference within these Terms. The “Sites” encompass the QM websites and any and all other websites owned by MOL and administered by QM, including all associated content, publications, materials, information, reporting, modifications, updates, enhancements, revisions, and new features, along with all services provided through such websites. You are responsible for regularly reviewing these Terms. QM reserves the right, at its sole discretion, to change, modify, add, remove or terminate any portion of the Sites or these Terms , in whole or in part, at any time, without prior notice. All changes to these Terms are effective immediately when posted to the Sites. Your continued use of the Sites following any changes to these Terms will constitute your acceptance of, and agreement to such changes. Your use of the Sites is authorized solely for your personal, noncommercial use for the applicable Purpose. In addition, if you are authorized by a Subscriber that has a current, QM Subscription to register as an Authorized Subscribing User of the Sites, you may register and use the Sites for the Subscriber institution/organization's internal purposes in accordance with the terms of its QM Subscription Agreement. To the extent that the terms and conditions of these Terms conflict with the terms of the applicable QM Subscription Agreement, the terms and conditions of the QM Subscription Agreement will control. As long as you comply with the provisions of these Terms, QM grants you a non-exclusive, non-transferable, limited right to access, privately display and use the Sites and content on the Sites for your own personal, noncommercial use and, and if permitted under the applicable QM Subscription, on behalf of the Subscriber institution/organization that has authorized you to register as an Authorized Subscribing User pursuant to its QM Subscription. If you download any Content from the Sites, you may not remove any copyright or trademark notices or other notices that go with it. Except as otherwise provided in these Terms, no part of any Content on the Sites may be copied, downloaded, stored in a retrieval system, displayed publicly on the internet for any other purpose, nor may it be redistributed for any purpose, without the express written permission of QM. Access or attempt to access any other user’s account, or misrepresent or attempt to misrepresent your identity while using the Sites, including misrepresentation as a QM agent or representative, or misrepresentation stating or implying our endorsement of you or your product or activity. Transmit to the Sites any content, or conduct yourself in any manner, that could be construed as defamatory, libelous, obscene, bigoted, hateful, racially offensive, vulgar, harassing, inflammatory, pornographic, violent, profane, threatening, unfair, inaccurate, deceptive or unlawful, or that could constitute or encourage conduct that would be considered a criminal offense or give rise to civil liability, whether under statute, common law or equitable principles, or otherwise violate any law. Send any bulk commercial email, or send any unsolicited email to any party without prior consent – such as within your institution/organization. Use the Sites in any manner that could damage, disable, overburden, or impair the Sites or interfere with any other party's use and enjoyment of the Sites. Use the Sites in any manner that could create a risk to a person’s safety or health, creates a risk to public safety or health, compromises national security, or interferes with an investigation by law enforcement. Obtain or attempt to obtain any materials or information through any means not intentionally made available or provided for through the Sites. Violate any code of conduct or other guidelines that may be applicable to any particular Sites service. Upload files that contain viruses, corrupted files, or any other similar software or programs that may damage the operation of another's computer or of the Sites’ servers. Interrupt or attempt to interrupt the operation of the Sites in any way. QM reserves the right at all times to disclose any information as necessary to satisfy any applicable law, regulation, legal process or governmental request, including personally identifiable information, or to edit, refuse to allow or to remove any information or materials, in whole or in part, in QM’s sole discretion. In the course of using the Sites, you may be required to enter certain information, including without limitation personal information (collectively, “Information”), in order to gain access to certain products or services. You represent, warrant and agree that you will provide QM with full, true and correct Information, and update such Information on the Sites promptly as reasonably necessary and as required by QM. QM does not claim ownership of any data, information (both personal or otherwise) or other materials that you enter through the Sites (collectively, "Materials"). There are two types of Materials: (a) Materials that are uploaded through the accounts of Authorized Users of the password-protected portions of the Sites for purposes specific to such Authorized User and/or such Authorized User’s institution (collectively, “Account Materials”), and (b) Materials that are uploaded by users for purposes of general dissemination, such as postings to any blogs that QM may offer, or (or Authorized Users) Feedback, defined below (collectively, “General Materials”). By transmitting, uploading, inputting, providing or submitting (collectively, “Submitting” or “Submit”) any Account Materials, you are granting perpetual QM, its licensors and affiliated companies and sublicensees a non-exclusive, royalty-free, worldwide right to (i) post such materials for your access and use, (ii) provide your Account Materials to other Authorized Subscribing and/or Registered Users, faculty, reviewers, institutional and independent facilitators, your institution, MOL, and QM, and (iii) make those uses of Account Materials that are either identified at the time you provide such Account Materials or can reasonably be anticipated by you, all while your account with QM remains open, and to archive such materials thereafter. By Submitting any General Materials, you are granting QM, its affiliated companies and sublicensees a non-exclusive, royalty-free, perpetual, worldwide, irrevocable and fully sublicenseable license in and to such General Materials for use for any purpose, and confirming that such General Materials are non-confidential and non-proprietary. You hereby waive all rights to any claim against QM Entities (defined below) and any Sites users for any alleged or actual infringements of any proprietary rights, rights of privacy and publicity, moral rights, and rights of attribution in connection with Materials. In the event that you Submit to QM any Account Materials for the purpose of making such materials generally accessible to other Sites users, such as posting such materials on QM’s blog, such materials will be deemed General Materials and you grant QM a General Materials license in such materials. If you provide QM with Materials such as comments, bug reports, feedback or modifications proposed by you to QM, the Sites, or the goods and/or services provided through the Sites (collectively, “Feedback”), then in addition to the license granted in all Materials, QM will have the right to use such Feedback at QM’s discretion, including but not limited to incorporating such Feedback into the Sites and the right to assign, license or otherwise use such Feedback. You hereby give QM a perpetual, irrevocable, non-exclusive license under all rights necessary to incorporate such Feedback and use such Feedback for any purpose. No compensation will be paid with respect to the use of your Feedback. You will be responsible for your own Materials and the consequences of transmitting those Materials. QM has no obligation to monitor your use or any other user’s use of the Sites. QM reserves the right to review and monitor your use of the Sites, including without limitation your use of any user ID and/or password in accessing the Sites and any Materials Submitted to or revised on the Sites, and to remove any Materials that QM believes in its sole judgment violate these Terms. QM reserves the right to restrict or terminate your access to the Sites, including, without limitation, your access to any or all of the services provided thereunder or your ability to use any Sites user ID and/or password, at any time without notice if we believe you have violated these Terms or are likely to violate these Terms. In the event of termination of your user ID and/or password, QM may delete and/or store, in its discretion, Materials and data associated with your use of the Sites. QM may also change, suspend, or discontinue any aspect of the Sites at any time, including the availability of any Sites feature, database, or content. Unless otherwise set forth in a written agreement between you and QM, you must adhere to QM's linking policy as follows: (i) any link to the Sites must be a text only link clearly marked “QM websites,” (ii) the appearance, position and other aspects of the link may not be such as to damage or dilute the goodwill associated with MOL’s and/or QM's names and trademarks, (iii) the appearance, position and other attributes of the link may not create the false appearance that your organization or entity is sponsored by, affiliated with, or associated with QM, (iv) when selected by a user, the link must display the Sites on full-screen and not within a “frame” on the linking websites, and (v) QM reserves the right to revoke its consent to the link at any time and in its sole discretion. YOU AGREE THAT YOUR USE OF THE SITES IS AT YOUR OWN RISK. EFFORTS BY QM TO MODIFY THE SITES SHALL NOT BE DEEMED A WAIVER OF THESE LIMITATIONS. THE SITES, INCLUDING ALL CONTENT, INFORMATION OR SERVICES PROVIDED THROUGH, OR IN CONJUNCTION WITH, THE SITES, IS PROVIDED "AS IS," AS AVAILABLE WITHOUT REPRESENTATION OR WARRANTY OF ANY KIND TO YOU OR ANY THIRD PARTY, INCLUDING, WITHOUT LIMITATION, ANY EXPRESS OR IMPLIED WARRANTIES (1) OF MERCHANTABILITY OR FITNESS FOR A PARTICULAR PURPOSE, (2) OF INFORMATIONAL CONTENT OR ACCURACY, (3) OF NON-INFRINGEMENT, (4) OF QUIET ENJOYMENT, (5) OF TITLE, (6) THAT THE SITES WILL OPERATE IN AN ERROR FREE, TIMELY, SECURE, OR UNINTERRUPTED MANNER, ARE CURRENT AND UP TO DATE AND ACCURATELY DESCRIBE QM’S PRODUCTS AND SERVICES, OR ARE FREE OF VIRUSES OR OTHER HARMFUL COMPONENTS, (7) THAT ANY DEFECTS OR ERRORS IN THE SITES WILL BE CORRECTED, OR (8) THAT THE SITES ARE COMPATIBLE WITH ANY PARTICULAR HARDWARE OR SOFTWARE PLATFORM. IN NO EVENT SHALL QM OR MOL, OR ANY OF THEIR OFFICERS, DIRECTORS, AGENTS, EMPLOYEES, REPRESENTATIVES, INTERNAL OPERATING UNITS, AFFILIATES, SUBSIDIARIES, SUBLICENSEES, SUCCESSORS AND ASSIGNS, INDEPENDENT CONTRACTORS, AND RELATED PARTIES (COLLECTIVELY, THE “QM ENTITIES”) BE LIABLE TO YOU OR ANY THIRD PARTY FOR ANY LOSS OF PROFITS, LOSS OF USE, LOSS OF DATA, INTERRUPTION OF BUSINESS, OR ANY DIRECT, INDIRECT, INCIDENTAL, SPECIAL OR CONSEQUENTIAL DAMAGES ARISING OUT OF OR IN ANY WAY CONNECTED WITH THE USE OF THE SITES OR WITH THE DELAY OR INABILITY TO USE SAME, OR FOR ANY BREACH OF SECURITY ASSOCIATED WITH THE TRANSMISSION OF SENSITIVE INFORMATION THROUGH THE SITES, OR FOR ANY INFORMATION, PRODUCTS, AND SERVICES OBTAINED THROUGH OR VIEWED ON THE SITES, OR OTHERWISE ARISING OUT OF THE USE OF SAME, WHETHER BASED ON CONTRACT, TORT, STRICT LIABILITY, REGULATION, COMMON LAW PRECEDENT OR OTHERWISE, EVEN IF QM HAS BEEN ADVISED OF THE POSSIBILITY OF DAMAGES AND EVEN IF SUCH DAMAGES RESULT FROM QM’S NEGLIGENCE OR GROSS NEGLIGENCE. BECAUSE SOME STATES/JURISDICTIONS DO NOT ALLOW THE EXCLUSION OR LIMITATION OF LIABILITY FOR CONSEQUENTIAL OR INCIDENTAL DAMAGES, THE ABOVE LIMITATION MAY NOT APPLY TO YOU. IN SUCH STATES, LIABILITY OF QM ENTITIES SHALL BE LIMITED TO THE FULLEST EXTENT PERMITTED BY LAW. ADDITIONAL DISCLAIMERS APPEAR WITHIN THE BODY OF THE SITES AND ARE INCORPORATED HEREIN BY REFERENCE. TO THE EXTENT ANY SUCH DISCLAIMERS PLACE GREATER RESTRICTIONS ON YOUR USE OF THE SITES OR THE MATERIAL CONTAINED THEREIN, SUCH GREATER RESTRICTIONS SHALL APPLY. THIS INDEMNIFICATION SHALL APPLY TO THIRD PARTY CLAIMS AS WELL AS CLAIMS BETWEEN THE PARTIES. You will indemnify, defend (or settle) and hold harmless QM Entities from all claims, actions, proceedings, losses, settlements, judgments, liabilities, suits, damages, disputes or demands, including without limitation any proceeding, investigation or claim by a state or federal agency or commission, and including reasonable attorneys fees and all other costs, fees, and expenses (collectively, “Claims”) against any of the QM Entities to the fullest extent permitted by law arising out of or in connection with (1) your conduct, provision of content or use of the Sites, or such actions by any third party through you, (2) your violation of the rights of another person or party, (3) any Materials provided or made available by you, and (4) any breach or violation by you of your obligations under these Terms, including without limitation any breach of your representations and warranties herein. You will not settle any indemnified claim without the prior written consent of QM, such consent not to be unreasonably withheld. In connection with any Claims that may give rise to your indemnification obligations as set forth above, QM Entities shall have the exclusive right, at their option, to defend, compromise and/or settle the suit, action or proceeding, and you shall be bound by the determination of any suit, action or proceeding so defended or any compromise or settlement so effected. The remedies provided in this Section are not exclusive of and do not limit any other remedies that may be available to QM Entities pursuant to this Section. In the event you establish an account as an Authorized User and receive or establish a password for such account, you are responsible for maintaining the confidentiality of your account and password, and for restricting access to your computer or device. You accept full responsibility and liability for all activities that occur under your account or password. QM reserves the right to refuse service, terminate accounts, or remove content in its sole discretion. You represent and warrant that the information you supply during any registration or update process will be accurate and complete and that you will not (1) impersonate or misrepresent your association with any person or entity, including without limitation registering under the name of another person, or seek to conceal or misrepresent the origin of any content or information provided by you, (2) choose a user name that QM in its sole discretion deems inappropriate, or (3) choose a user name for the purposes of deceiving or misleading QM as to your true identity. You agree not to impersonate any other person. You further agree not to falsely affiliate with any institution or organization. Authorized Users may obtain user names and passwords to sign into the MyQM data portal for access to their individual profile, credentials, and activity with QM and to conduct business with QM. Subscriber-designated Quality Matters Coordinators (“QMCs”) have the same rights as other Authorized Users and are also eligible to register and create accounts for individuals at their institutions/organizations and have QMC system access which allows viewing of all QM credentials and activity for individuals affiliated with their own institution/organization – either registered by the QMC or by the individual directly, or in the case of Lead Quality Matters Coordinators (“Lead QMCs”), individuals affiliated with institutions/organizations in their own statewide group. Authorized Subscribing Users have access to additional QM Services and Materials – not provided to non-subscribing users. 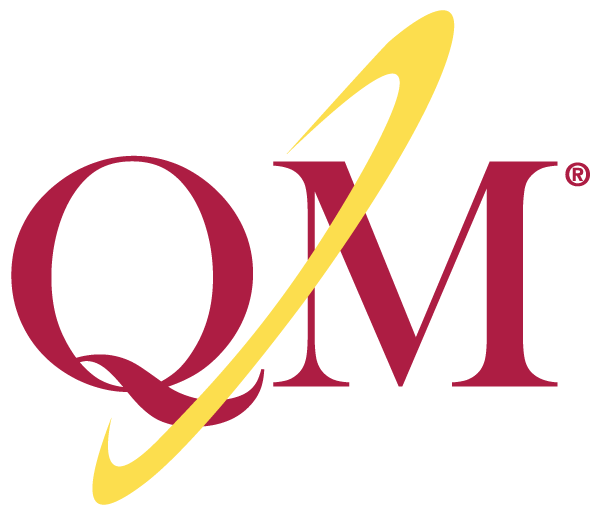 Upon the expiration or termination of the Subscription under which your Authorized User – Subscriber access has been provided, or your affiliation with the QM Subscriber has ceased, you will no longer be able to access or use any of the QM Services or QM Materials restricted via the Sites to Authorized Subscribing Users. Thereafter, you shall have no further right or ability to access the QM Services or any data stored in QM’s computing environment that are restricted for Authorized Subscribing Users. You shall notify QM immediately of any unauthorized use or threat of unauthorized use of your account or the Sites or of any other breach or potential breach of security known to you with respect to your account or the Sites, including without limitation any loss or compromise of any password, and will cooperate with QM in every reasonable way to help QM prevent the further unauthorized use, threat of unauthorized use, disclosure or threat of disclosure regarding the Sites, your account and/or your password. You agree that immediately upon termination of your right to use the Sites or any password-protected portion of the Sites, or upon any earlier demand by QM at any time, you will cease all access and/or use of the Sites or such password protected portion of the Sites, and will not attempt to access and/or use same. You acknowledge that by use of password-protected portions of the Sites, you may use and you may acquire QM Confidential Information. As used herein, “Confidential Information” means all confidential and/or proprietary information and trade secrets of QM, whether or not memorialized, and in any form or media, regarding QM or QM’s business, including without limitation those relating to QM’s intellectual property, rubrics, technology, research and development, systems, software, business plans, business operations, strategies, financial information, technical information, customers, customer lists, suppliers, operating policies and procedures, and any third-party information that QM is required to keep confidential where such information is not generally accessible without a password. “Confidential Information” includes any account passwords. You shall not at any time, directly or indirectly, for any purpose, use, copy or disclose to any other person or entity any Confidential Information, or permit others to do so, other than for the purposes expressly allowed hereunder. QM may seek and obtain injunctive relief against the release or threatened release of Confidential Information, in addition to any other available legal remedies. You shall notify QM immediately if you learn of any unauthorized possession or use of the Confidential Information and will promptly furnish all details of such possession or use to QM. The Sites and all content, organization, graphics, design, compilation, magnetic translation, digital conversion, and other matters related to the Sites (collectively, “Content”) are protected under applicable copyrights, trademarks, and other proprietary (including but not limited to intellectual property) rights pursuant to international conventions and U.S. and other laws. The Sites and all Content is the property of MOL, QM and/or third party licensors, and all right, title and interest in and to the Sites and Content will remain with MOL, QM or such third party licensors. Third-party products and company names mentioned herein may be the trademarks of their respective owners. You do not acquire ownership rights to the Sites or any Content other than any rights in the Materials that you may have. You will abide by any and all additional copyright notices, information, or restrictions contained in any Content. You will not modify, adapt, translate, reverse engineer, decompile, or disassemble the Sites or any Sites content. You may only use the Sites and the Content as expressly permitted herein, and any other use is prohibited. Any copying, republication, or redistribution of the Sites or Sites content, including by caching, framing, or similar means, is expressly prohibited without the prior written consent of QM and/or the respective intellectual property rights holder identified in the subject content, which consent to be granted or withheld at the sole discretion of the rights holder. By making QM’s proprietary logos, trademarks and service marks available on the Sites, QM is not granting you any license to utilize any of such logos (including those displayed below and derivative marks), service marks, or trademarks. Any unauthorized use of the Content may violate copyright laws, trademark laws, the laws of privacy and publicity, and civil and criminal statutes. QM respects the intellectual property rights of others and expects our users to do the same. If you believe that your work has been copied in a way that constitutes copyright infringement, please provide QM’s Designated Copyright Agent, identified below, with all information required by the Online Copyright Infringement Liability Limitation Act of the Digital Millennium Copyright Act (“DMCA”), 17 U.S.C. § 512, summarized as follows: (1) a physical or electronic signature of a person authorized to act on behalf of the owner of an exclusive right that is allegedly infringed; (2) identification of the copyright work claimed to have been infringed, or, if multiple copyrighted works at a single online Sites are covered by a single notification, a representative list of such works at that Sites; (3) identification of the material that is claimed to be infringing or to be the subject of infringing activity and that is to be removed or access to which is to be disabled, and information reasonably sufficient to permit us to locate the material; (4) information reasonably sufficient to permit us to contact the complaining party; (5) a statement that the complaining party has a good-faith belief that use of the material in the manner complained of is not authorized by the copyright owner, its agent, or the law; (6) a statement that the information in the notification is accurate, and under penalty of perjury, that the complaining party is authorized to act on behalf of the owner of an exclusive right that is allegedly infringed; and (7) any other materials or information as may be required under the DMCA as amended from time to time or by the U.S. Copyright Office. You and QM each agree to submit to binding arbitration in the event of a dispute, controversy or claim (each, a “Dispute”) arising out of or in connection with these Terms or the breach, termination, enforcement, interpretation or validity thereof (including the determination of the scope or applicability of these Terms to arbitrate), your or QM’s rights and obligations under these Terms, the Sites, the use of the Sites, and/or the information, services and/or products that may be provided by or through or in connection with the Sites. The arbitration will be held in the State of Maryland before one arbitrator on an individual basis and not as a class action. You expressly waive any right you may have to arbitrate a dispute as a class action. You also expressly waive your right to a jury trial. The arbitration will be administered by JAMS (http://www.jamsadr.com). You may obtain a copy of the rules of JAMS by contacting the organization. You and QM shall agree on one arbitrator to conduct the arbitration. In the event the parties cannot agree on an arbitrator, the arbitrator will be selected in accordance with the JAMS rules. Each party shall be responsible for its own attorney, expert and other fees, unless such fees are awarded by the arbitrator to the prevailing party. Notwithstanding anything to the contrary in this Section, to the extent you have in any manner violated or threatened to violate QM’s intellectual property rights, QM may seek injunctive or other appropriate relief in any state or federal court in Baltimore, Maryland and you consent to exclusive jurisdiction and venue in such courts. These Terms provides that all Disputes will be resolved by binding arbitration and not in court or by jury trial. IF A DISPUTE IS ARBITRATED, YOU GIVE UP YOUR RIGHT TO PARTICIPATE AS A CLASS REPRESENTATIVE OR CLASS MEMBER ON ANY CLASS CLAIM YOU MAY HAVE AGAINST QM ENTITIES INCLUDING ANY RIGHT TO CLASS ARBITRATION OR ANY CONSOLIDATION OF INDIVIDUAL ARBITRATIONS. WITHOUT LIMITATION, THIS INCLUDES GIVING UP YOUR RIGHTS TO BRING OR PARTICIPATE IN A CLASS ACTION AS SET FORTH IN ANY STATE STATUTE. To the maximum extent permitted by law, these Terms are governed by the laws of the United States of America and the State of Maryland, excluding any law or conflicts of law principle that would apply the law of another jurisdiction. To the extent a Dispute is not governed by the Arbitration Clause, you hereby consent to the exclusive jurisdiction and venue of courts in Baltimore, Maryland in all disputes arising out of or relating to the use of the Sites or under these Terms; provided, however, that in the event QM is sued or joined by a third party in any other court or in any other forum in respect of any matter which may give rise to a claim by QM hereunder, you consent to the jurisdiction of such court or forum over any claim which may be asserted by QM therein. You irrevocably consent to the exercise of personal jurisdiction by such courts in any such action. In addition, and notwithstanding the foregoing, you irrevocably waive, to the fullest extent permitted by law, any objection that you may now or hereafter have to the laying of the venue of any such suit, action or proceeding brought in any such court and any claim that any such suit, action or proceeding brought in any such court has been brought in an inconvenient forum. Final judgment in any such suit, action or proceeding brought in any such court shall be conclusive and binding upon you and may be enforced in any court in which you are subject to a jurisdiction by a suit upon such judgment. Use of the Sites is unauthorized in any jurisdiction that does not give effect to all provisions of these Terms, including without limitation this paragraph. To the extent a claim is not governed by the Arbitration Clause, QM and you each hereby waive the right to a trial by jury in any court and in any suit, action or proceeding, whether in tort, contract, or otherwise, in which any such party is a party, as to any claim arising out of or in connection with these Terms, your or QM’s rights and obligations under these Terms, the Sites, use of the Sites, and/or the services and/or products that may be provided by or through or in connection with the Sites. If and when any products or services referenced on the Sites become available, they will become available in the United States and may not become available elsewhere. QM makes no claims that the Sites or any products or services referenced therein may be lawfully viewed, accessed or used outside the United States. Access or use of the Sites or any products or services referenced therein may not be legal by certain persons or in certain countries. If you access or use the Sites from outside of the United States, you do so at your own risk and you are responsible for compliance with the laws of your jurisdiction. You agree that no joint venture, partnership, employment or agency relationship exists between you and QM as a result of these Terms or your use of the Sites. Section headings and other captions in these Terms are used solely for the convenience of the parties, have no legal or contractual significance, and shall not be used in interpreting, construing or enforcing any of the provisions of these Terms. The provisions of the following sections shall survive any termination or expiration of these Terms: Disclosure Under Law, Materials, Authorized User Representations and Warranties, Disclaimers, Indemnification, Confidentiality, Copyright and Other Intellectual Property, Dispute Resolution (Arbitration Clause), Choice of Law; Jurisdiction and Venue; Waiver of Jury Trial, and Miscellaneous. The failure of QM to enforce any provision of these Terms will not be construed as a waiver or limitation of QM’s right to subsequently enforce and compel strict compliance with that provision or any other provision of these Terms. No assignment, delegation or other conveyance of these Terms may be made by you (by operation of law or otherwise) without the prior written consent of QM, to be given in its sole discretion. QM may assign its rights and obligations hereunder to any other party. Any cause of action you may have with respect to your use of the Sites must be commenced within one year after the claim or cause of action arises; thereafter, any such claim will be forever barred, without regard to any contrary legislation. In the event that any provision of these Terms is deemed to be unenforceable, said provision will be interpreted to reflect the original intent of the parties in accordance with applicable law, and the remainder of these Terms will continue in full force and effect. Notices to QM under these Terms shall be sufficient only if in writing and transmitted via personal delivery, delivered by a major commercial rapid delivery courier service, or mailed, postage or charges prepaid, by certified or registered mail, return receipt requested, to QM, with such notices being effective as of the date of actual, confirmed receipt by QM. Notices to you are deemed effective if sent to the email, fax, mail address or other contact information provided by you, and are deemed effective upon the earlier of being confirmed received or one day after having been sent. Inquiries regarding this policy should be directed to terms@qualitymatters.org.